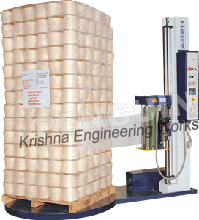 Krishna Engineering Works offers comprehensive stretch film wrapping machine. We are a leading manufacturer, exporter and supplier of Stretch Film Wrapping Machine from last 25 years. Our Stretch Film featuring with quality like, improved load holding, tear resistance, excellent clarity and many more to meet International Standards. We are dealing on Stretch Film Wrapping Machine like Pallet, Carton Box, Reel and many more. Also, All type of Rubber Roller Manufacturer for different Industries. Heavy duty turn table for all industrial applications. Sturdy mast and machined guide ways for guiding the stretch unit. Compact stretch unit with change gears to vary stretch percentage. Suitable for a wide range of stretch film material. Imitation Copying or Using Photographs or Text from this Website is a Punishable Offence. Krishna Engineering Works reserves the right to change specifications & design without prior notice to incorporate latest development.